A son’s and brother’s love knows no bounds. That is Douglas Hyams, the son of Sylvia Hyams and brother of Elizabeth and Sharlene Hyams. Sylvia Hyams, 83 years old, a former nurse in Assunta, has two children of her own, Elizabeth, 61 years and Douglas, 45 years, and two adopted children Sharlene, 24 years and Peter. 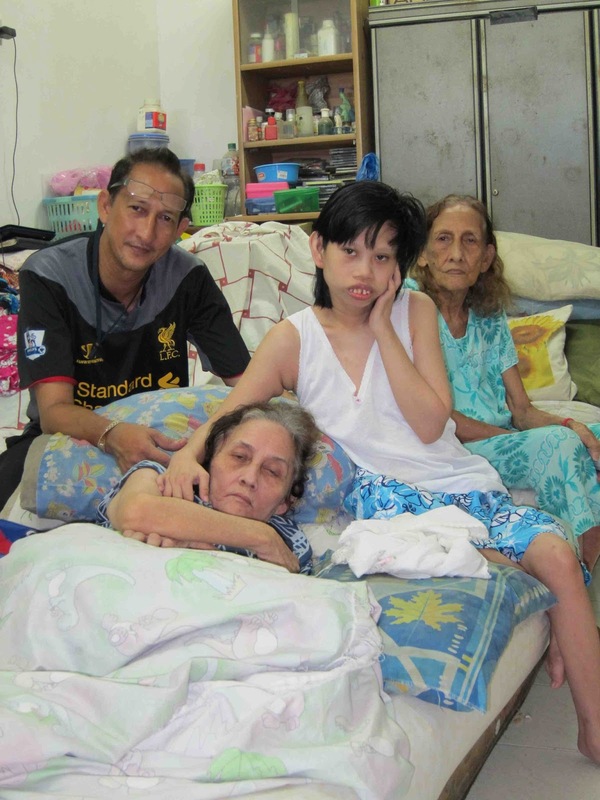 Sharlene with Down’s syndrome and Peter with cerebral palsy, were abandoned by their parents when they were babies. Sadly, Peter passed away 4-5 yrs ago at the age of 21 yrs. Sylvia suffered a stroke in 1999 and 14 years later, at the age of 83, she is still caring for Sharlene and Elizabeth. 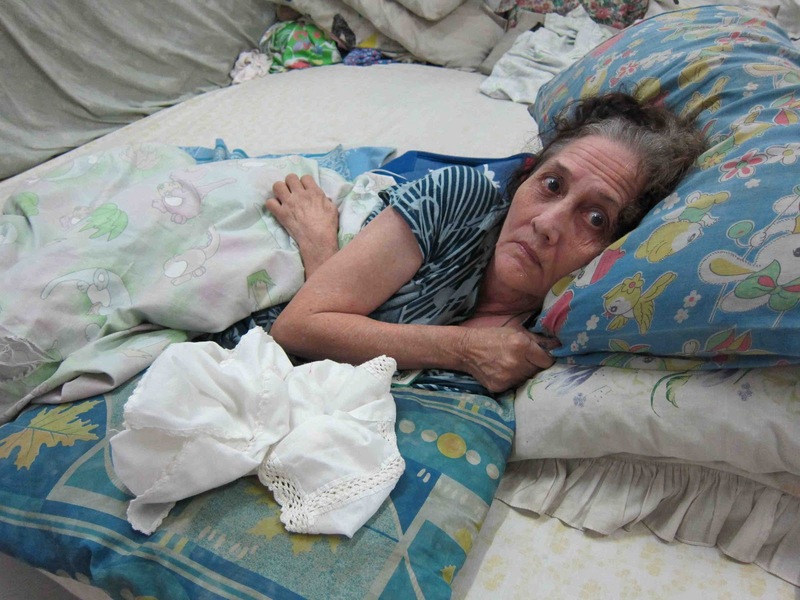 Sylvia is hunched back, has cataract, and difficulty in walking, and thus cannot do much house work. 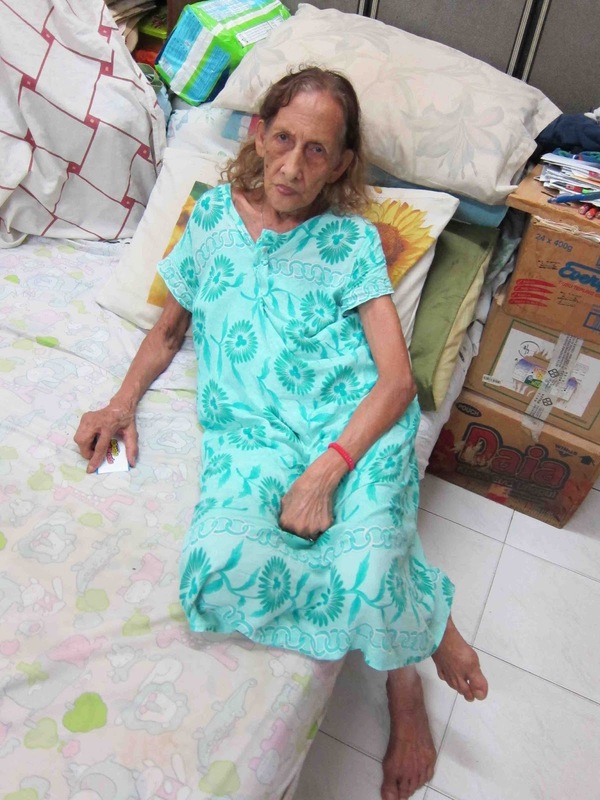 Elizabeth suffered a stroke in Nov 2012, and requires physiotherapy at the hospital, 2-3 times a week. She also goes for weekly accupuncture treatment sponsored by a samaritan who paid RM300 for 25 sessions. She wears adult diapers, size M (3 pcs a day), preferably Tena as other brands give her rashes. Sharlene, at 24 yrs, only consumes milo and condensed milk, still using a milk bottle. When I visited on 1st May, 2013, she was happily sitting in front of the TV. She wears diapers children size XXL (3 pcs a day). Both Elizabeth and Sylvia, who were stroke victims, have been advised by their doctors to cut down on oily foods, and eat more fruits and vegetables. The family sleeps in the living room on the ground floor of the double-storey house. The first floor is not habitable as it has asbestos ceiling and is currently used to store used clothes and other items donated by people that are of not much use to them now. Douglas is slowly clearing the first floor whenever he has the time. Douglas is the sole breadwinner in the family. Although he completed his SPM, he did not go to college as he has to work to feed his family. He used to do odd jobs and brings home about RM500 to RM600 a month only when there is work to be done. He also looks after two dogs for his uncle and gets RM80 per month to supplement his income. On 1st May 2013, he started work as a night security guard for a nearby Prudential office, for RM900 per month. He cannot do a full time day job as he needs flexible work hours to bring his family members for frequent hospital visits. 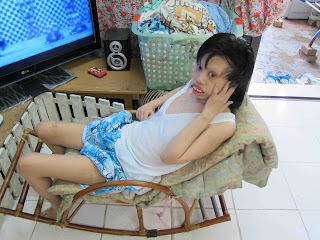 He buys food for his mum and Elizabeth daily, and helps his mum bathe Sharlene and Elizabeth. He takes them out whenever he can, but not very often. The places he goes to must have wheelchair as his old beat-up 2-door Satria cannot fit in a wheelchair. It will be nice if he has a wheelchair-friendly vehicle (like a van in which a wheelchair can be wheeled up and down easily) to take his family for outings. Besides Douglas income, Sylvia gets RM300 a month from Social Welfare, while Elizabeth gets RM300+ a month from SOCSO. Douglas main concern now is the RM8000+ TNB bill he needs to settle to avoid supply disruption. He has tried appealing and getting help, but all in vain. Fortunately, their house is fully paid for by a good Samaritan some years ago. Douglas is amazing … he is selfless and truly loves his family and happily cares for their well-being. He indulges the family, like buying grapes, which is his mum’s favourite fruit, whenever he has some extra cash. The Hyams is currently in our MOW FOOD BANK program. If you wish to visit/help the family in other ways, please contact Kim at 012-3036019 or email yeapkimsee@hotmail.com. Thank you in advance for your support in helping the Hyams have a better quality of life.